Absolutely, Positively, Have to Know? As you probably know, there are thousands and thousands of different chords - everything from basic major chords to minor 7ths to 13ths to suspensions to poly-chords. Someday, you might want to learn all those chords if you don't already know them. But meanwhile, there are 3 chords -- just 3 -- that you absolutely, positively have to know. If you don't know these three, there's hardly a song in the whole world that you could play. But by knowing just 3 chords, you can play hundreds, if not thousands of songs! Huh? What's all that about? So if I build a chord on the "I" -- every other scale note up from C, the chord is C, E, and G -- known as the "C major chord". If I build a chord on the "IV" -- every other scale note up from F, the chord is F, A, and C -- known as the "F major chord". If I build a chord on the "V" -- every other scale note up from G, the chord is G, B, and D -- known as the "G major chord". Please notice, if you haven't already, that those 3 chords contain ALL the notes in the C scale! So any melody - tune - in the key of C (as long as it just uses the 8 notes of the scale) can be harmonized just by playing one of those 3 chords! Think about that -- that's a HUGE insight that most people never get. So, in any given key you can play in, there are PRIMARY CHORDS -- chords that occur way more than other chords. They are like family members of that particular key. At your house, let's say you have 3 people in your family -- your spouse, your child, and you. On the same block, but down the street a few houses, lives your cousin and her family. At any given moment, who are the most likely people to be in your house? Yasser? George W? Barry Bonds? No sir. I don't think so. It's possible, of course, but not too likely. If I had to guess, I would say it would be either you, your spouse, or your child. It might be your cousin down the street -- there's a much better chance of that than, say, David Letterman -- but my best odds would be to guess that the family members would be there. It's the same way with chords. 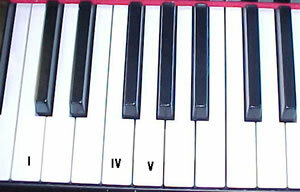 In any given key, there are 3 "family members" that are residents of that key -- the I chord, the IV chord, and the V chord. They are far and away the most likely chords to occur in any given key. For example, if I am playing in the Key of C, and the first chord is the C chord and I have to guess what the next chord is, I would guess that it would be either the F chord or the G chord. Why? Because those are the other "family members". So we have narrowed the odds a great deal just by knowing who the members of the family are. Does that mean that there are always just 3 chords in a song? No, but there are literally hundreds of songs that are made of just 3 chords. Do you have to know all these chords in all these keys? You can choose to play in just one key, or just a few keys. But what you must know is the 3 chords in whatever key you want to play in! That means that the stark beginner can learn 3 chords in just a few minutes, and be able to play along with thousands of tunes, because most folk songs, hymns, country songs, and many rock songs just use the 3 basic chords. That's why people who know zilch about music can pick up a guitar, learn 3 chords, and strum along while singing everything from "On Top Of Old Smoky" to "Amazing Grace" to "My Country 'Tis Of Thee" to "Auld Lang Syne" to "Silent Night" to ... well, you get the idea. And not only a guitar, but a piano, keyboard, or whatever. That's it for this time. Next week, we'll expand our horizons a bit, and take an overview of the types of chords available to us in addition to these 3 absolutely essential chords.